If you have a health and beauty product that’s small and portable, packaging can easily be part of your value proposition. When you can offer your customers faux eyelashes that stay clean, dry, and unbent between uses, they’ll see them as an investment rather than a one-off purchase. When your makeup brushes or hair beads stay safely stashed, your customers won’t have to deal with a messy search at the bottom of their purse: any time saved in our busy schedules get points on the convenience meter. Opt for a square design that slips into a weekender bag or a circular or oval design that can safely stand up to the jostling of a purse without opening or breaking—you can create choices for your customers. 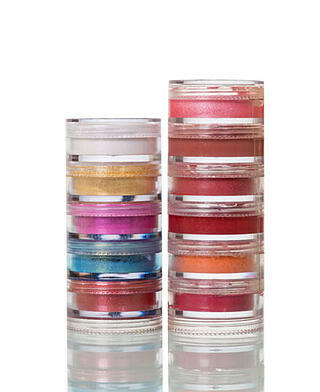 Your packaging needs to communicate essential information to the end users about your cosmetic or beauty product. Rigid plastic packaging doesn’t get thrown away, allowing important information, such as ingredients, usage, and expiration dates to remain available for easy reference. When your logo stays visible on a countertop or in a drawer, the consumer is more likely to remember your product when the time comes for a refill or replacement. If your product needs to stay out of contact with water, rigid plastic containers help there too, keeping moisture and humidity away from the product inside. Remaining efficient in a hectic world requires organization, and small measures like easy visuals for fill-level checks on products can help consumers plan their time better—it takes the guesswork and worry about running out of a product out of the equation. If your cosmetic or beauty product comes in several configurations, rigid plastic packaging can make customization easier and more appealing to an end consumer. Whether you’re looking to sell a set of several colors, other varieties, or want to offer a full palette, individual rigid plastic containers or tubes make swapping easy. This beauty packaging solution is versatile, as well: the rigid plastic “base” can be sold as a standalone accessory, called out as a “bonus” with the purchase of your product, or framed as a value-added set when you include products as part of the package. If you want to make sure your cosmetic or beauty product is highly visible, enduring, and appealing to your customers, make sure you’re working with the right packaging. Rigid plastic cases, boxes, tubes, and more give you the appeal you need to appeal to your customers’ desire for a quality product. As the largest manufacturer of high-quality rigid plastic boxes in New England, Alpha Rho has been a leading provider of plastic packaging solutions to the food and confectionary industries for over 50 years. Contact us for recommendations, orders, and assistance finding the perfect look and fit for your products.